Consciously working to open the Third Eye in our daily spiritual practice is crucial. Daily exposure to sunlight, particularly at dawn or dusk, will help, as will exposure to moonlight. 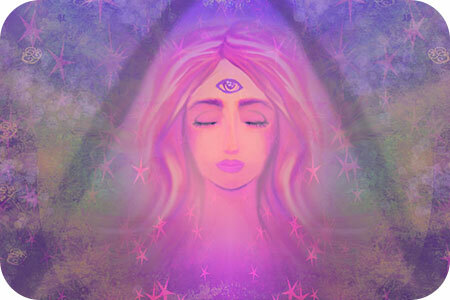 Active visualization of the Third Eye during meditation, actively stimulates the pineal gland. Crystals, especially those in violet and indigo, such as amethyst or tourmaline, can also be added to enhance Third Eye meditations. Try placing a favorite crystal upon the brow. Seek out new spiritual experiences in all that you do, and don’t be afraid to ask your spiritual guides and angels for their assistance. In a busy world full of incoming sensory data, finding quiet, uninterrupted time is a wonderful practice for our health as a whole. The Ajna Chakra is not surprisingly linked to the Third Eye, so ensuring that all the chakras are open and working in harmony is also a key ingredient. So, what exactly happens once the Third Eye is fully opened? Many people report that it as if they are seeing the world for the first time. Engaging in other psychic practices which may have seemed previously impossible may now be within reach. The Third Eye is known for being a gateway to lucid dreaming, as well as deeper understanding of the Tarot. If you’re not doing so already, keep a journal of your observations and insights, as well as to record your dreams. For the same reasons you wouldn’t want your car to be running at a fraction of its capacity, why would you want to go through your life without the benefit of the Third Eye and its gifts? If you’re having trouble getting started, find an experienced psychic practitioner as a mentor or visit a special spiritual location to help you to get ‘unstuck.’ Once your Third Eye begins to fully open, you’ll start to be able to see this world and beyond with much sharper clarity.